Stay cool with this quick and easy lunchtime idea. Tortillas topped with lettuce, tomatoes, tuna, onions and cheddar cheese. What more could you ask for? Spread tortillas with mayo; sprinkle with dill. Fold in sides of tortillas, then roll up. Pack these tasty wraps with some crunchy fresh vegetables for part of your lunch. Substitute shredded cabbage for the lettuce, 1 red pepper for the tomatoes and/or 1/4 cup chopped celery for the onions. 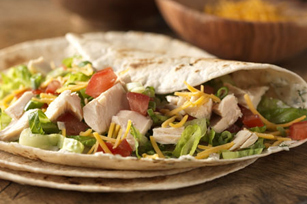 Combine all ingredients except tortillas; refrigerate up to 4 hours. When ready to serve, spread lettuce mixture over tortillas; roll up as directed.